Write (1) your name and (2) address with PIN code and (3) phone. Please note that your cash payment to SBI bank usually takes place on the same day. Cash and online transfer take less than 1 day and while cheque deposit takes 1 or 2 days. 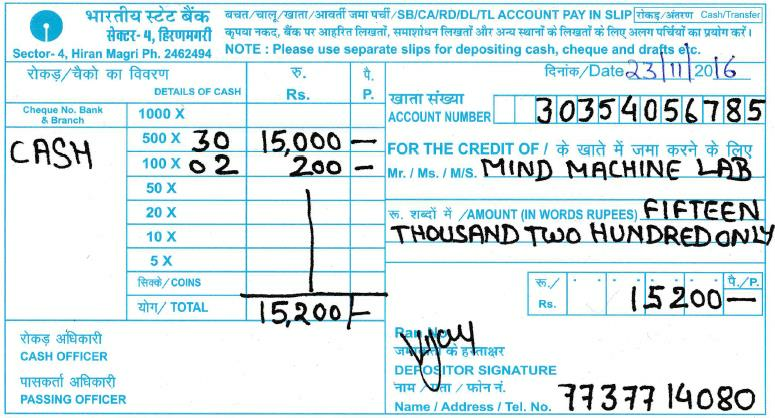 Note: This example below shows a deposit slip filled up for paying Rs 15,210 by Cash to our SBI account. You mention account number and company name in shown as red colored circle, amount in words in pink colored circle, and details of amount in green colored circle.